Klavan on Culture: The Extremists are Coming!!! So very sorry to vent here, but to post a comment there you gotta go through this whole sign-up process now and it's just not worth it. I just wanted to take apart the troll logic for a moment. No qualifications required other than live in the city limits for a year, etc... And the trolls yuk it up. Um, yeah. That's pretty much the case for every office in America. You know there aren't really any "qualification requirements" to be President either, right? You just gotta be a natural-born citizen and 35 or older. Tens of millions of US citizens meet those requirements. Doesn't mean they, or Levi, have a snowball's chance in a very hot place of being elected to anything. Palin-haters have the maturity level of two-year-olds. My apologies to those currently going through the Terrible Twos. The implication of course is that this means being Mayor is no big deal, therefore Palin is no big deal, etc... Heh. Sure, Levi. You just keep telling yourself that when you get a total of two votes on election day. I decided to look it up because I suspected you have to spend a certain amount of time in the US to qualify to run for Prez, and sure enough - http://www.presidentsusa.net/qualifications.html. Have to live here for 14 years. Sorry I don't keep up here as much as I should. I've taken to using Twitter lately instead of the blog to fire off my random thoughts. You can follow me @barbaricblog if you don't already. Palin's speech in Anaheim last night was awesome. The best (IMHO) since the RNC convention. 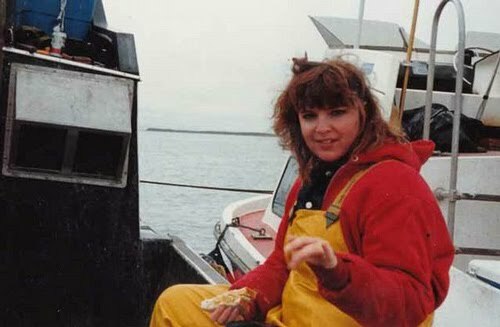 I absolutely loved when she took on the Delta smelt. People are more important than a two-inch fish. I think my favorite part (besides the fish) was when she told the media that she would invoke Reagan: "Again, and again, and again, and again..."
Like rubbing salt in the wound. I could feel liberals wincing. It also set me to thinking about how great Reagan really was. We have his example to look back on; he pioneered. I'm not comfortable with calling Palin "Reagan reincarnate" or Thatcher or anyone else. I see similarities with them and many others and often make comparisons, but Palin is also her own unique self. In other news, TLC has new pics out, in case you haven't seen them yet. I can hear the criticism now. "She doesn't actually do those things, it's just for the reality show!" Uh-huh. Sure. Exhibits C, D, E, & F.
I'm sure way back when Sarah Palin was, ya know, four or five and her Dad was teaching her how to skin a seal she was thinking, "Better get my bonafides down for the reality/travelogue show that I'll do someday." Right.